NOTE: Sea wall repairs will begin in June, and continue through September. The work is on the seawall in front of the condo and there will be noise associated with it, from 8-5, weekdays, though not every day will be affected by the construction. In exchange for the inconvenience, the rental rate has been discounted 10-20%, depending on length of stay, during construction. Meanwhile, the beautiful morning and evening views will be unaffected. Get away to a beautiful oceanfront location that offers the best of both worlds for a fraction of the price of a hotel. This Kahana Reef suite features one bedroom, one bath, full kitchen, and sleeps 2 adults and up to 2 children. Included are Smart TV with cable, Bluetooth/FM stereo and high-speed WiFi. There's no need for air conditioning in the cooler micro-climate of Kahana, where temperatures are often 10 degrees cooler than Lahaina thanks to this unique location and steady trade winds. 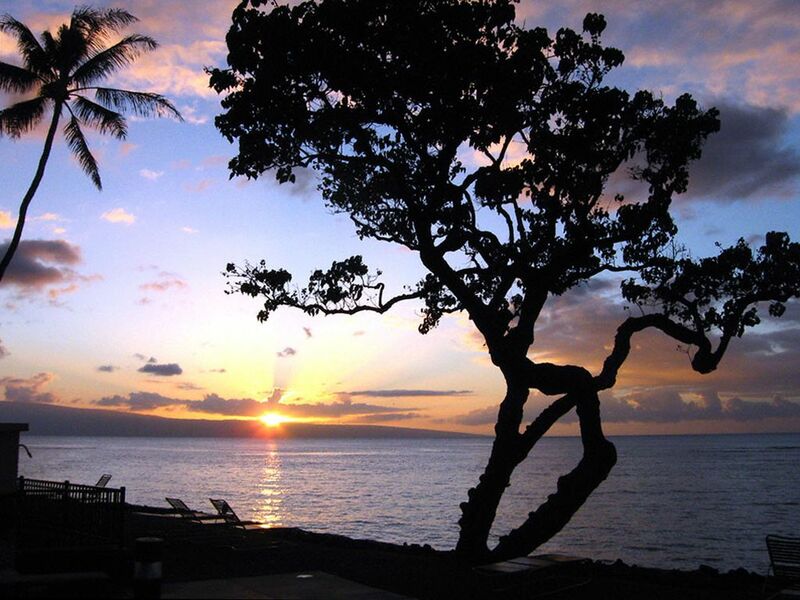 Kahana Reef features uncompromised views of the islands of Lanai and Molokai from your private lanai. Ours is an attractively furnished and comfortable ground-floor unit, so the suite has a much larger feel to it ~ the lawn beyond the lanai is like your front yard as you look out over the lovely ocean vista. The grounds also include a swimming pool, barbecue grill, and laundry facilities. This is a non-smoking unit, for guests who want to enjoy the clean, fresh air of Maui. This Kahana Reef condominium is in an excellent location ~ a peaceful and secluded oceanfront property that is very accessible to golf, beach and water activities, dining, and shopping. Or, just sit back, relax, and enjoy your Hawaiian holiday by the ocean. Tip: Enjoy cocktails and dinner on the lanai while watching the sunset. What's not to love about the climate, culture, oceans, mountains, forests and cuisine of Hawaii? We looked all around Maui, and fell in love with Kahana Reef's beautiful and peaceful setting. Kahana's cooler microclimate was a factor, too. It's more comfortable than Kihei and Lahaina, with no need for air conditioning. And the occasional misty rain provides for many rainbows. And then, there are the views of Molokai, Lanai and Oahu. Over the years, we have never gotten tired of those views! Off the beaten path, Kahana Reef is very private yet accessible to beaches, shopping, dining and touring the island. 30 ft from the water with a beautiful views of the islands of Molokai, Lanai and Oahu. Bluetooth/FM stereo. Mahalo for being considerate of your neighbors when playing music. There is a sharing library of books in the laundry. The Kapalua courses are a 5-10 minute drive North. The Ka'anapali courses are a 10-minute drive South. Ceiling fans in livingroom and bedroom. Due to Kahana's cooler microclimate, there is no A/C at Kahana Reef. Great location, fantastic views, away from the crowds. Perfect for two, but can accommodate up to four. Walking distance to Maui Brewing Company, that’s a plus. We have stayed here many times and will continue to stay here again and again. This is a nice condo and the owners are easy to work with. Would definitely recommend this unit. We loved our stay, clean and well maintained. Beautiful views of the ocean right outside. Hosts answered questions promptly and cheerfully. Beautiful sunsets viewed from the lanai! And beautiful views of the ocean and the island of Molokai from the living room and kitchen area. Hiking and beautiful beaches close by. Would stay again, thank you! Our three nights in this condo was a great choice for the two of us. Coffee maker & Brita-filter water pitcher help us enjoy our sunrise coffee on the patio with a panoramic view and watching whales spouting in the channel in front of Lanai & Molokai. Condo shows some age but been maintained properly; bed is comfortable & shower has plenty hot water. The cross breeze was lovely and rooms were very comfortable with ceiling fans and windows/door open. We will definitely consider staying here again, hopefully soon. The beach is right outside of the unit. Very nice scenery. However, the unit needs serious renovation. We loved our week stay! The condo was in a great area, very clean, perfect for couple or small family. The ocean view was spectacular; the pool was a minute away, as was a cove that was perfect for our grandkids. Would highly recommend, unless you are looking for a high-end unit. Very comfortable, but not luxurious . We would definitely return! GOLFERS: The Kapalua Plantation Course hosts various tournaments throughout the year ~ the course is just 10 minutes away! A nominal cleaning surcharge applied for stays less than 7 nights. Reservation is confirmed when deposit payment is received.